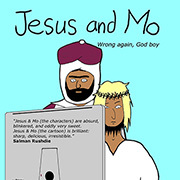 Jesus and Mo will be back on April 12th. And therein is the key to religion. Hook them with “salvation” then temper them with “fantastic stories”. Once you have people beleiving in nonsense like that they’ll beleive anything you tell them… and do anything you tell them. Although it is sheer unadulterated madness and wishful thinking mixed with a “conspiracy theory” lunatic kind of mind… I do have a certain respect for people who at least have the balls to say “This is the set of stuff I believe”. Then we all know where we stand and we can pull their beliefs apart. What *really* gets up my arse are those people who can’t express their beliefs clearly enough for me to be even half-sure that they have the faintest comprehension of what they are talking about. Yes, I know one person like that, and he drives me totally round the bend. Am I just too stupid to understand his remarkable reasoning? Or is his reasoning entirely bogus and slippery, like a confusing and greased-up eel? Mark, I think your ‘friend’ uses spurious reasong as a justification for their irrational dummy sucking behavior. Opioid addicts are the same. They invent all sorts of nonsense to justify the odious practice. Religion is a morphinergic narcotic in a genuinely physiological sense. Well that was quite hilarious! 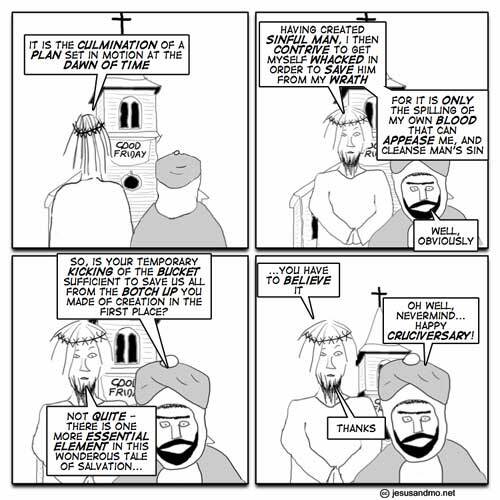 Here Jesus shows the “real” ideology and fantasies of the 3 in 1 God: Sado-Masochism! Viva the resurrection on Sunday! or is it 1 in 3 ? Love the comic – wanted to buy the book but Lulu makes it impossible. Can’t even view it – have my options set to “Mature” but still can’t view it – certainly can’t buy it – and can’t find a way to even send Lulu an email until tomorrow. Sheesh. HAH! you should make a google home page add-on for your strip! I see now why Tom Cruise chose to believe in the Thetans instead! You gotta love the mental knots the authors of religious texts get into when they try to describe the motivations of a supposed omnipotent being! 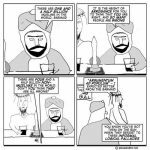 Boiled down to its essential ‘truths’ religions are utterly hilarious, well done! Religious salvation is akin to Listerine both inventing mouthwash and the problem of halitosis. The Bible contradicts everything it says, and I think that sometimes people only believe so that they can take justification from the Bible. Ironically, there will probably be something with which you could counter in there; last year I was doing The Break From Rome in History, and to be honest with you, both Henry and the Pope took their arguments from the Bible. Basically all it is is a web of lies which hasn’t been thought through and is thus very complicated, untrustworthy, and I’m pretty sure you cannot rely on the Bible for anything, as you will just have to iron out and explain any holes in this fabrication of falsehoods. I can believe anything. If you say it’s true I can believe it.